This week's challenge over at Lollipop Crafts is Something Old, Something New. The sponsor spotlight is on Karber Digital, so I have used a Karber image for my challenge card. I used the Nesties to cut out the Karber image and also for the scalloped circle mat. I have a cloud template that I have had in my stash for probably about ten years (!!!) that I still use now to sponge clouds on my projects. I now have a small collection of Washi tape and am trying to get the hang of using them on my projects. So far, I'm liking washi! I also used a stamp from a new MME stamp set I recently purchased. It's the "Just Be You" sentiment under the angel. Be sure to check out Karber Digital to purchase this angel digi or to check out their other images! 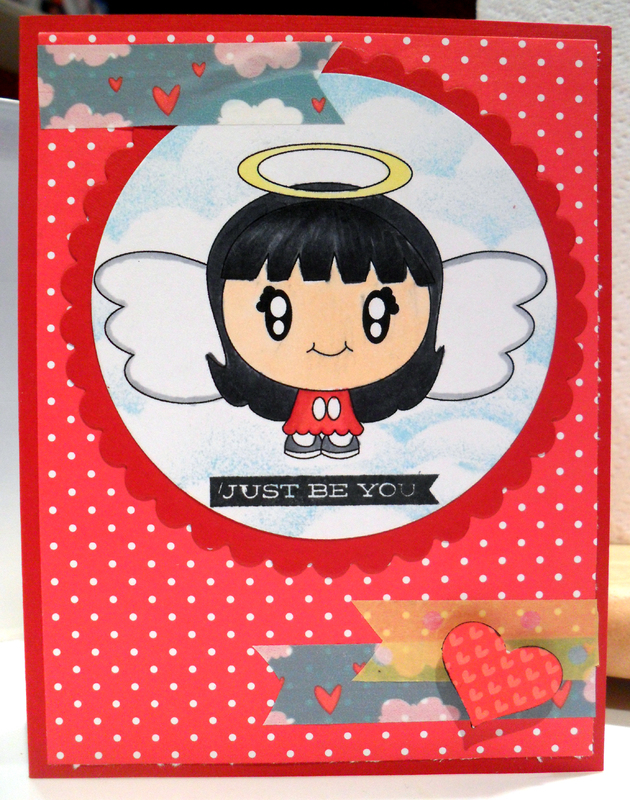 Don't forget to visit Lollipop Crafts and enter this week's challenge, too!